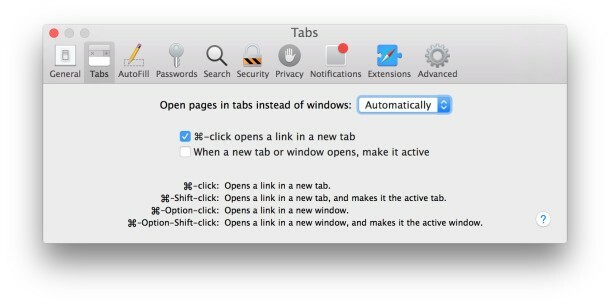 You can set Safari in Mac OS X or Windows to always open new windows into new tabs instead. In fact, new versions of Safari default to a variation of this behavior, but older versions need Safari to manually be set to open new windows as tabs, but with a little adjustment you can make Safari open all windows always into tabs, even those tiny pop-ups you may encounter on some websites. Yes really, ALL windows in Safari. 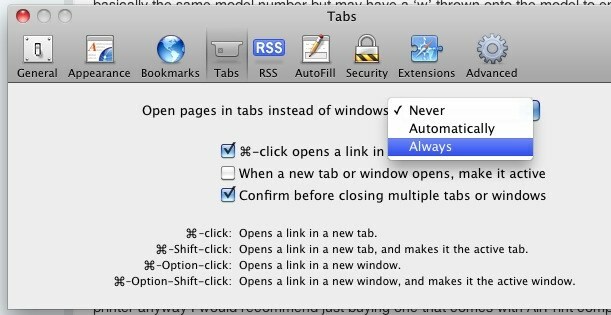 Note the default setting in modern versions of Safari on Mac and Windows is “Automatically” – this is different from the “Always” setting which overrides the small windows that are sized for things like videos or other accessory browser windows. Now anytime a new window is created it will instead go to a new tab in the currently active containing window. This works in the Mac OS X version of Safari and the Windows version too. It’s supported in all versions. You should mention that this catches pop-ups too which is helpful when you have one of those annoying Flash popups that runs in the background and heats your Mac up to 250° while rocketing the CPU to the moon. I don’t understand why this isn’t default, it’s always one of the first things I change! Okay, it is nice, but if I want to open just one page in a window what I should do? ?